This year we are hosting a family friendly NYE Beach Party event at Nobby's Beach Surf Club! Tickets are $100 for an ALL INCLUSIVE night! 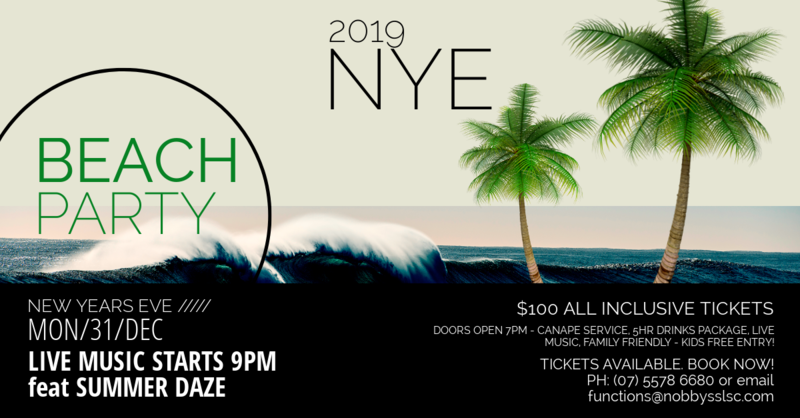 Put on your best beach themed/ Hawaiian get up and come and enjoy mouthwatering flowing canapes, icy cold beverages and live music from 9pm whilst bringing in 2019 with all your nearest and dearest! Kids under 12 y/o are free entry - Doors open 7pm! PLEASE NOTE: Anyone under the age of 18 MUST be off premise by 12am Midnight.